Alive! Calcium is derived from Lithothamnion (calcified red algae seaweed sustainably harvested from pristine Icelandic waters). 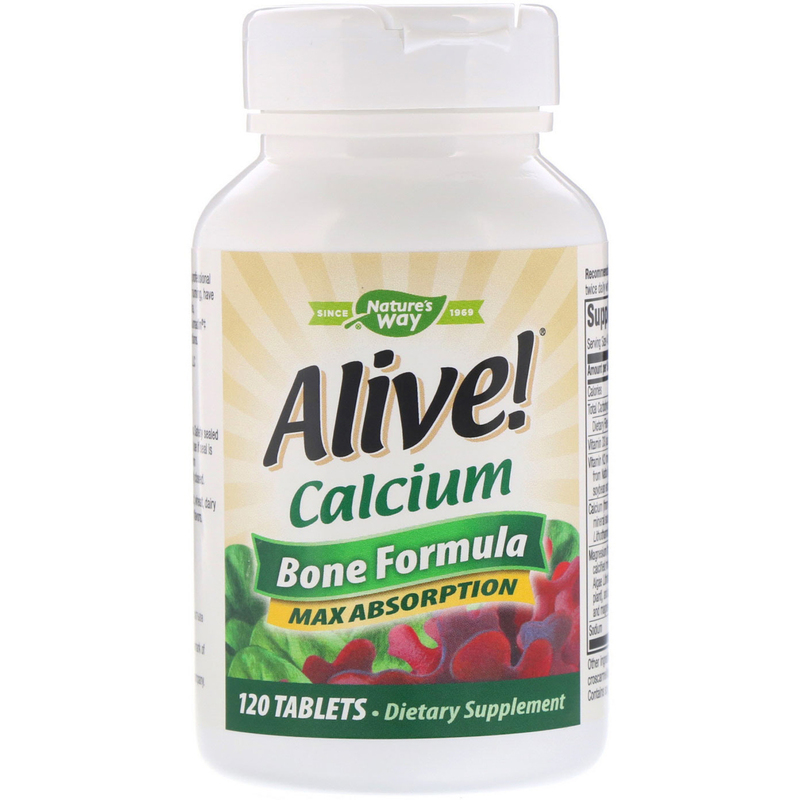 While many calcium supplements are sourced from limestone rock or animal bones, Alive! Calcium provides Aquamin calcium that may be easier for the body to digest, absorb, and utilize. Adequate calcium intake throughout life, as part of a well-balanced diet and regular exercise, may reduce the risk osteoporosis. Alive! 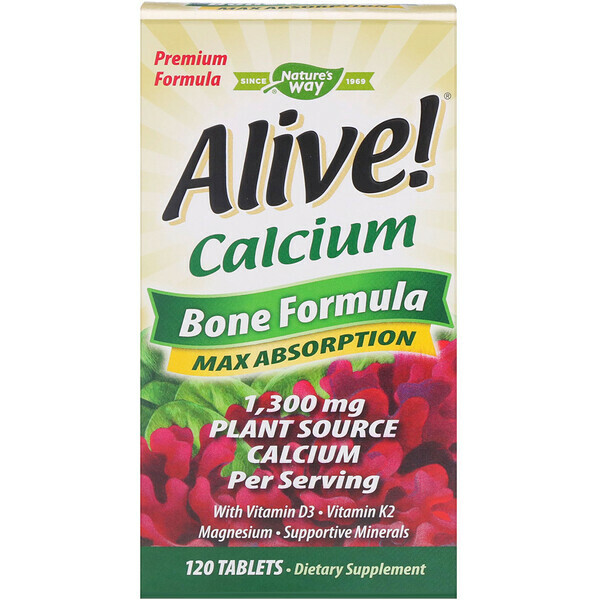 plant source calcium provides 1,000 mg of calcium per serving (100% DV), vitamin D3, vitamin K2, magnesium and supportive minerals, such as strontium and boron, which promote healthy bones. Vitamin D3 enhances calcium absorption and utilization. Magnesium helps maintain bone density. Vitamin K2 (MK-7) directs calcium to the bones where it's needed most. 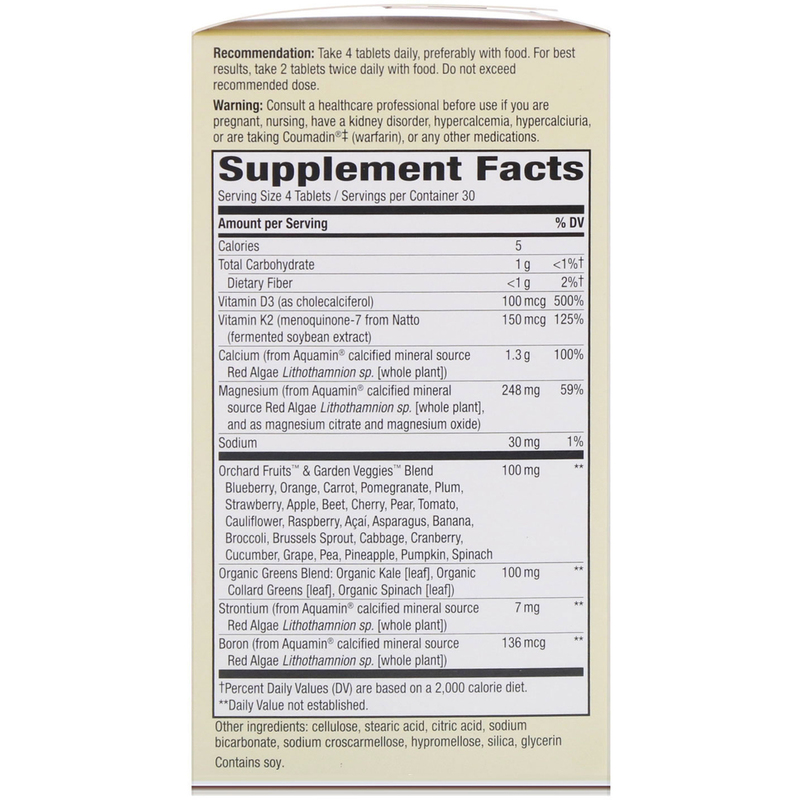 Contains 100 mg per serving. Some ingredients include Orange, Blueberry, Carrot, Pomegranate, Plum. Cellulose, stearic acid, citric acid, sodium bicarbonate, sodium croscarmellose, hypromellose, silica, glycerin. No sugar, yeast, wheat, dairy products, or artificial colors or flavors. Consult a healthcare professional before use if you are pregnant, nursing, have a kidney disorder, hypercalcemia, hypercalciuria, or are taking Coumadin (warfarin), or any other medications. Keep out of reach of children. Safety sealed with printed inner seal. Do not use if seal is broken or missing. Store at room temperature. Keep bottle tightly closed.